*eyes melt* THANKS A LOT TRES!!!! 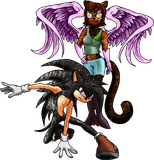 Sick...In so many ways....I've only seen one thing worse than that, and that's SonicXShadow pics. Why do you do such a thing? Better than his current image. Subject: Re: Do you want this?